April 15, 2014---The Nation's Tyrannosaurus rex, found in Montana 26 years ago, arrived early Tuesday morning at the Smithsonian's National Museum of Natural History. 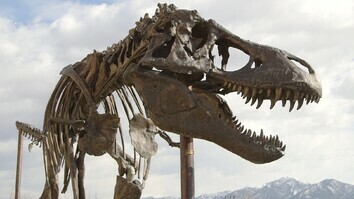 The public will be able to see scientists scanning and performing an inventory on one of the most complete T. rex fossils ever found. Among their tasks: to determine the proper way to mount the bones for display.